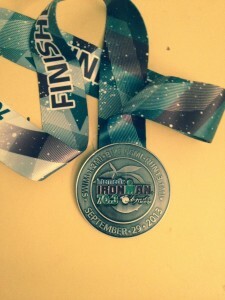 Finally taking a second to reflect on the Augusta Half Ironman, which was my first given I just started doing tris in June. So how did it go.. The night before I got absolutely no sleep courtesy of a restless 2 year old my head. Luckily for me, my wife’s parents were nice enough to take me over to the venue. Unfortunately I completely was unprepared for the cold wait. I sat shivering at the swim start in my silly tri suit, which I continually ask myself am I really wearing this stuff. Before I got completely iced over and needed a chisel to break me out of the block, a random lady came over and gave me a towel and a blanket. Blessed. The whole time I was waiting, I was really bummed because my wife and a friend were supposed to be in it with me, but both had to drop out. Finally put on my wetsuit and wondered around for a while talking to random people since I was totally by myself. My wave got called up and I headed out to the dock. Prior to the race, I was told to hit the middle or the far left to get a real fast current/draft. Positioned myself for it, was on the front row, but the moment I got in some fool behind me jumped on top of me. Everyone was told not to dive in, oh well. Not wanting to deal with feet, fists, and people not knowing how to deal with an open water swim I just opted to the far right (the slowest route). I almost got to swim completely by myself there, with the exception of some randoms who were confused, swimming sideways towards the shore. Swim was fun, felt easy. That was good because it was a bit of a fear going in, given the number of folks and the aggressiveness of my division. Jumped out of the water, opted not to have someone strip my suit off in fear of them ripping it and thinking I was faster than them. Went over to the bike and tried to get it off myself. Stuck. Pulled and pulled and pulled. Nothing finally got it off and it yanked my timing chip off. Didn’t know it, headed out, then realized, had to head back, got it. Lost time for silliness. Got on the bike. I love to bike, its fun. I’ve been doing around 100 miles in about 5 hours without pushing it hard, and figured I’d go easy and keep it the same. Not many folks past me even at that rate, except the disc crews which seemed to be like gangs. At one point a lone disc went by, I glanced over and had to take a second take. Noticed @davemirra ahead of me. Thought I was back at Jaycee or the BD bowl for hot minute on my board. Cool to see someone from a similar background dealing with the horrors of spandex. However, something tells me he wasn’t checking out the scenery like me. I turned into that guy, you know the one, was totally jabbering with folks as I rode. The ride was a lot of fun and leisurely, but the sun beat on me with no sunscreen and I didn’t have enough fluids stored on my bike. Something about going from one thing to the other your brain gets hog tied or something. Went into transition, got my gear on fast, running out, where’s the strap for my heart rate monitor? Feel off, had to run back and look in the chute for it. Found it and ran out. Lost time for silliness. So I’m now into the run at my standard pace, finish the first mile with a sub 7 minute mile. Then the big boom. I reach back to get my nutrition, salt tablets, etc. and find my ziplock back had opened up. All my stuff is lost or unusable right at the point I need it. My bike doesn’t carry enough fluids and I didn’t swap them out on the course so I knew I had better slow down since I didn’t have what I needed earlier to prep for this. I ended up dropping way back from even a normal pace. After running for a bit, I tried to take an alternate, grabbed a few of the perform drinks but they tasted like sugar cough syrup. I totally don’t get why they don’t have decent stuff on the course. I really don’t like taking in garbage. Since there wasn’t a really good solution, I kept it turtle time. My family was on the course a few times and got to give hi fives to the kids. I loved seeing the, in retrospect maybe there is something I can do when I see them to make the boys excited. Overall the race was a blast. I had no real goals for the race other than to get a feel for it and go at a regular/easy pace. I didn’t want to get hurt since it was practice for a bigger event. I did mess up royally in both transitions, but really took it on the run. The transitions should have been 1/2 of what they were. I would have liked to have had a normal run just to see what my time would have been without dropping pace down. I really didn’t care though since it was fun and I was trying to just figure things out. I’m waaaay faster on the run and bike, so I’d love to do it again and actually go for speed now that I’m more comfortable with it. Going forward, I know getting the wetsuit off is an issue, I need better fluid storage on the bike, and I ABSOLUTELY need a backup plan for my nutrition and better way to store it. I’m already continuing with the craziness of getting ready for the big one, and its crazy, a bit to crazy for me. Just a few more weeks to the real race. Is ActionScript 2 still used? We rarely have ActionScript 2 based projects these days at Dreamsocket, but a few still pop up now and again. Most of the time when they do it is because the project had some limitation that required it to be ActionScript 2. Recently we had two projects that had this type of limitation. One was using ScaleForm, a C++ Flash implementation which is typically used to create UIs for games (on platforms like the PS3, XBOX, etc). In our case we were creating a UI for a set top box platform. The other was for a random banner ad that needed to play nice in foreign environments. In both cases we turned to our as3for2 framework. The moment ActionScript 3 came out, it was clear the new language was much simpler and cleaner to work with. Having a lot of large ActionScript 2 projects at the time that we wanted to port, we created a framework that wrapped ActionScript 2 to emulate the new ActionScript 3 objects and interfaces. It enabled us to slowly port chunks of code over to the point we just had to change a few syntax points and the code was now running atop ActionScript 3. That definitely was helpful but it was more of a short term transitional usage of the framework. Where it has been invaluable are projects like the ones mentioned above where we have to step back in time because of limitations that won’t allow us to use ActionScript 3. The sad thing is we’ve sat on this code base for about 5 years without sharing it. I guess it is better late than never. So today we are releasing the framework under an MIT license for anyone who still has to dabble in ActionScript 2. What is in the framework? Adobe recently took a large step in changing the way video gets rendered in the Flash player. For the most part the player has always taken a large role in rendering video to the screen. With the release of Flash player 10.2 this has all changed. Now if you explicitly tell the player to, you can offload the video completely to the hardware which decreases CPU usage (literally to 0%), lowers memory usage, enables higher frame rates, and overall enables greater pixel fidelity and video quality. Obviously with all the upcoming phones, tablets, and connected TVs this has an even higher impact on a video applications experience. At Dreamsocket we’ve been fortunate enough to be an early adopter with projects on these platforms. From developing video player’s tailored for Android phones to creating Cartoon Network and Adult Swim’s GoogleTV apps, we’ve been able to see the impact this new change has, in addition to figuring out the best way to integrate it into existing applications. All that said, the one thing that really struck us was how unique the new StageVideo API is. I say unique because it is a completely new API and is completely different than working with the Video object. I understand the differences, however do you really need to force someone to go back and recode everything just to use it? I know it forces a user to explicitly think and spend time putting StageVideo into an app, but why? It should be EASY. I mean really EASY. Enter StageVideoProxy. We wanted to go into all of our video applications and simply swap out a Video object reference for a new Class that would use StageVideo if present and fallback to using a standard Video object if it failed. By having a simple class that extended Video, we could just swap out the instance and proxy all the calls to StageVideo when it was available. This made it EXTREMELY easy to retro fit any existing application with StageVideo functionality. In addition, we kept all 10.2 API references in places that would not get called in players below 10.2, making the code backwards compatible. Super right? Well we did find a few limitations. First, StageVideo doesn’t really have a way to clear the video, so we had set the size to 0 width and 0 height to “clear” it. Second, we don’t really know depth of display objects vs other display objects easily, so we don’t have a way to determine z depth for the videos. The second step doesn’t really matter though, given the implementation currently only supports a single StageVideo instance. I’d like to add support for multi videos, but I’m still unclear on how many I can have and what dictates that. I understand how to know when they are there and when you hit your limit, but I’d still like to fully understand it before I add it in. * Copyright (c) 2010 Dreamsocket Incorporated. Developers that have been using Flex should be pretty familiar by now with the Embed metadata tag which allows you to embed assets into a SWF (like images, SWFs, XML, etc). This option has also been added to CS4 (CS4 uses the Flex SDK to complete this task). Now lets create the ActionScript file that embeds the JS into a SWF, writes it to the page, and calls the hello function in the lib. You can download the full example here. Pretty nifty eh? Hope this shows you a neat little trick to use in distributing some of your SWF/JS libraries.